Tom Brennan has announced the Claire Mawdsley Scholarship And Rider Recognition Program in conjunction with the Pennsylvania National Horse Show. Photo by Mollie Bailey. Top hunter/jumper trainer Tom Brennan is bringing new motivation and rewards to junior riders who balance full-time regular school with a love of showing. Brennan, with the support of the Pennsylvania National Horse Show, is introducing the Claire Mawdsley Scholarship And Rider Recognition Program. This memorial scholarship will reward individuals competing in the junior hunters who attend traditional school full time. The first scholarships will be awarded at this year’s Pennsylvania National, Oct. 9-18 in Harrisburg, to the top placing eligible exhibitors in each of the four junior hunter sections. 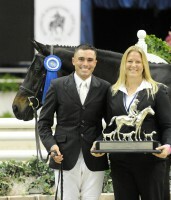 Winners will receive a scholarship award that will be held in trust by the horse show until they enroll in college. The top three eligible students in each section will also receive special ribbons and sponsored prizes. The program is free to enter and only requires the junior indicates his or her intention to participate on the Pennsylvania National entry and sends a letter from school indicating good academic standing. Brennan thought it important to recognize juniors who don’t get to spend as much time in the saddle as those who participate in online programs and have access to private tutors. “I’ve noticed a trend in the juniors where kids’ families are forced to make a decision between being competitive and making considerable sacrifices, or between being well-rounded and being involved in school,” Brennan said. The scholarship was named for Virginia Intermont College student Claire Mawdsley who was killed in an automobile accident while driving back to school after grooming at the Middleburg Classic (Va.) for Winter Hill Farm on Sept. 26, 2011. The program is being funded by tax-deductible donations, and if it proves successful, Brennan hopes to expand it in the future.